Vinyl fences have become an increasingly popular option over the last 20 years, and we’re pleased to offer them as part of our fence options. Home and business owners appreciate their style, durability and their many designs and colors. Manufactured to look great while also withstanding the elements, vinyl fences look much more expensive than they actually are. Neighbors will think you’ve invested in a custom wood fence with a meticulous paint job. Styles of vinyl fences include dog eared, flat top, lattice-topped privacy, picket, post-and-rail and many others. Our team is ready to help you find the right vinyl fence design to add beauty, safety and security to your home or office. All vinyl fencing systems come with a warranty. The life span of this warranty hinges on the style and grade of your vinyl fence system. Some vinyl fence systems are warrantied for up to 20 years. Vinyl fences come in a wide range of attractive styles and colors. 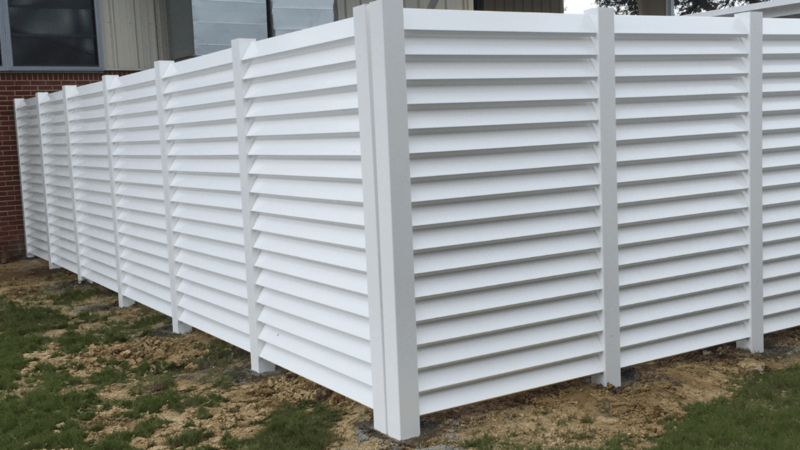 From a traditional vertical board privacy fence to a custom design, there’s a vinyl fence out there that will enhance your property. Select a color that suits you, and never worry about it chipping or cracking. Vinyl fences can withstand high winds and extreme swings in temperatures, including south Louisiana’s notorious heat. They can also resist salt water exposure, making them great for coastal properties and fish camps. Finally, they’re also resistant to termites and wood-boring pests, meaning you won’t have to repair or replace boards. Unlike painted or stained wood fences, a vinyl fence maintains its color forever. You may need only to give it a quick cleaning with a little soap and water. It’s a great choice for homeowners who want a sophisticated look without having to invest in regular maintenance. Vinyl fencing offers complete privacy, even more effectively than traditional wooden fences. Over time, wood fences can expand and contract, leaving small visible gaps between pickets. By contrast, vinyl is engineered to resist this kind of expansion and contraction. You’ll have complete seamlessness throughout the lifetime of your fence. Apex Fence Has a New Website!